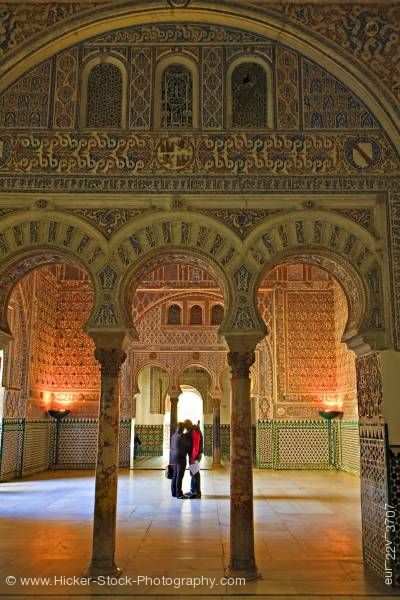 Stock photo of Salon de Embajadores (Ambassador's Hall), Palacio Mudejar, Reales Alcazares (Royal Palaces) - UNESCO World Heritage Site, Santa Cruz District, City of Sevilla (Seville), Province of Sevilla, Andalusia (Andalucia), Spain, Europe. The elegant archways lead to the Salon de Embajadores of the Palacio Madejar, Reales Alcazares. This stock photo shows the details of the Salon de Embajadores (Ambassador's Hall), Palacio Mudejar, Reales Alcazares (Royal Palaces) - UNESCO World Heritage Site, Santa Cruz District, City of Sevilla, Province of Sevilla, Andalusia, Spain, Europe. Beautiful details of the Salon de Embajadores’s archways with the lettering and designs on the walls along with the curve of the arches and their columns. The details of the center room in colors of red, gold and green. Two lanterns stand in each corner of the room reflecting light upward on the corner of the wall. Two people stand in the center of the room between the duplicating archways. The natural sunlight comes through casting the couples’ shadow on the floor. Salon de Embajadores (Ambassador's Hall), Palacio Mudejar, Reales Alcazares (Royal Palaces) - UNESCO World Heritage Site, Santa Cruz District, City of Sevilla (Seville), Province of Sevilla, Andalusia (Andalucia), Spain, Europe.